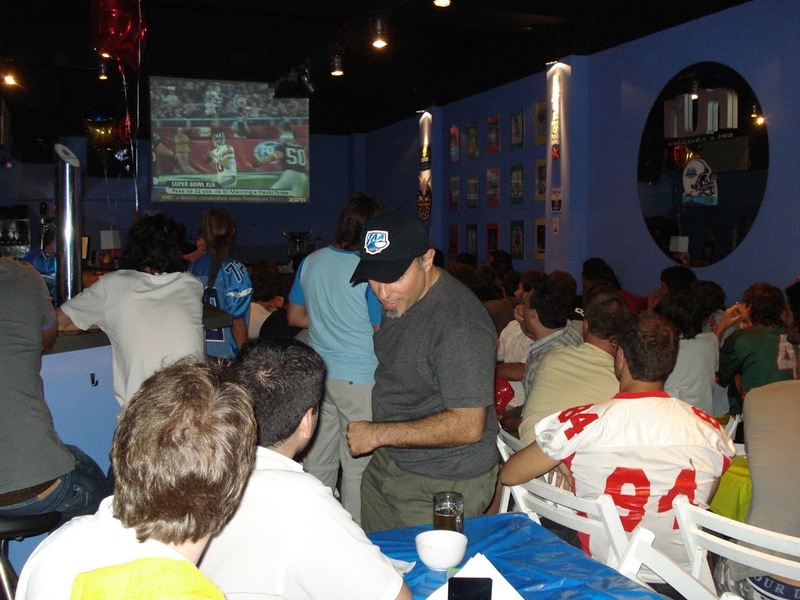 Super Bowl XLIII was watched by millions around the globe, and today’s post will give you a chance to see the game through two very unique vantages. As regular readers of this site know, Steel Curtain Rising is written out of Buenos Aires. Although yours truly has been here since 2001, Super Bowl XLIII was only the fourth Super Bowl I’ve seen down here. Believe it or not, there are Argentines who play American Football. Not two hand touch, not flag football, but full pads, full contact American Football. And let me tell you, these guys are serious, hard-core football men. So the FAA’s annual Super Bowl party was held in the Run Bar, nestled on the other side of San Martin across the street from the vacant Harrods building. 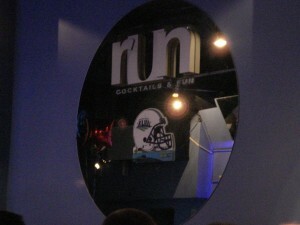 Let the record reflect that the rooting at Run Bar was probably 30-40% pro Arizona, 20-25% pro Steelers, and the rest more or less neutral. But my wife and I had the good fortune to land a seat next to Gustavo, and Argentine Dr. who has been an avid Steelers Fan since the 1990’s. We talked a fair amount of football, and I can tell you that the guy knows his stuff, and is even able to offer some rather nuanced opinions on Kordell Stewart. All the more impressive considering that the man has never even visited US, let alone Pittsburgh! The game itself of course was a heart stopper, but enjoyable nonetheless. The Cardinal’s cheering section was louder, but Steelers Nation’s contingent made up for any lack of quantity with quality. When it was clear that the Steel Curtain Had Risen Again, we even let out the rallying cry of Steelers Nation, “Chew Tobacco, Chew Tobacco, Spit, Spit, Spit, If You Ain’t A Steelers Fan You Ain’t Sh_t, Go Steelers!” Truthfully, the rest of those present didn’t quite know what to make of that, and were somewhat taken aback. Understandable, but history demands such that refined, time-honored traditions be respected. Aside from victory itself and the glory of the Steelers Sixth Super Bowl, aside from the joy of spending it with my wife (she stayed home for Super Bowl XL and I would have enjoyed it more had she been there), perhaps the biggest plus came after the game, when I gave Gustavo one of my extra Terrible Towels. He’d mentioned something about getting one of them during a break, but he seemed pleasantly surprised after the game when I asked my wife to get the Towel out of her purse and give it to him. Try as the NFL might to rip off the talisman that Myron Cope bestowed upon Steelers Nation, but the Terrible Towel will always be unique to Pittsburgh. The yellow terry cloth will always be a special bond between members of Steelers Nation, and Gustavo’s reaction to getting his first one proves it. I attended the game in Tampa Bay.The NFL Experience was OK but the entertainment was excellent. Prior to the kick off, John Legend sang for an hour followed by Journey. My Son-in-law and I then proceeded to the game after helping the local economy by buying a good amount of souvenirs. We watched the 1st half and were pleased that the Steelers were on the winning side at halftime. The play by both teams was marginal.We watched the halftime show and hoped the Steelers would not sit back and just run the ball because the Cards score very quickly. We were really excited with only 5 minutes to go with Pit steal on the win side. I watched with horror when I saw both safeties near the sidelines and no one anywhere near the middle. The ball was snapped and I did not see it happen because my eyes were glued on Fitzgerald. He glided across the middle and then the ball was in his hands. After he took off down the field James Farrior and Troy Polamalu went after him. They were 10 yds back and then #11 put the afterburners on. He pulled away so quickly, Troy tapped Farrior on the shoulder to give up. After that score, my heart sank. Three minutes to go and it looked as if the Cards might just win it. I just kept shaking my head even as the Steelers marched down the field. When the clock had 35 sec. I was in total denial. Big Ben threw to Holmes to the left and it went threw his hands. Depression began to set in. I looked up and saw Ben running to his right and fired the ball Brett Favre style and Holmes was covered by 3. The next thing I saw was the refs arms go straight up and the stadium erupted. The stadium looked as if it were Heinz Field south. The Terrible Towels outnumbered the Card fans by 10 to 1. They had between 7/10 thousand at most. As you can see, I am still not over the excitement yet. I was there for #6 and history being made. [My wife] and the neighbors back in Phoenix were rooting for the Cards. Thanks for visiting. Take a moment to share something from your Super Bowl experience, or just take a look around Steel Curtain Rising. 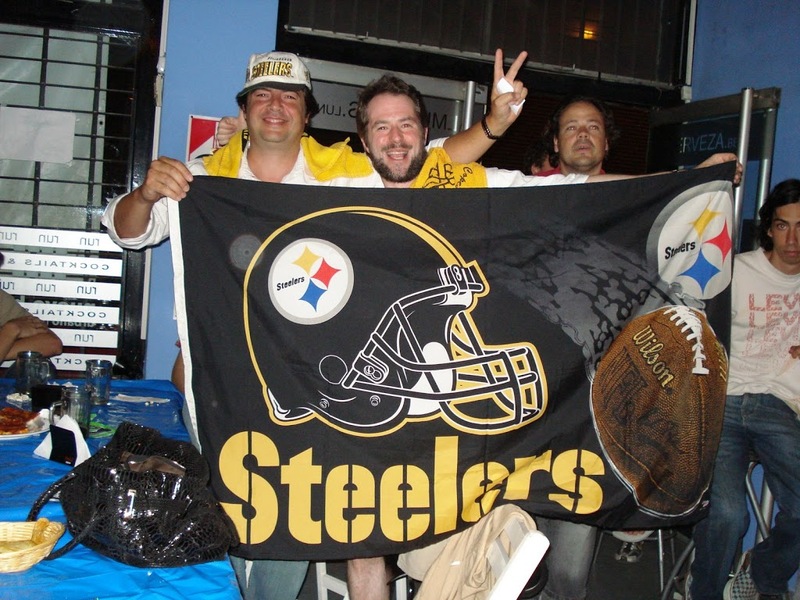 This entry was posted in Pittsburgh Steelers Fan Club of Buenos Aires and tagged James Farrior, Kordell Stewart, Pittsburgh Steelers, Steelers vs. Cardinals, Super Bowl XLIII, Troy Polamalu. Bookmark the permalink. Hi guys. I will try to do it in english, I’ll do my best. I’m Gustavo. The article guy, the steeler fan. I want to respond with my impressions of the Super bowl day. He asked me why are you a steeler fan? I don’t know, love at first sight, I think. I didn’t know, when I became a steeler, the great story behind the Steelers, the steel curtain, the terrible towel, the immaculate reception, I had no memories of the sunday mornings in the snow, drinking a hot soup, waiting for the game. Among my friend, I’m a kind of freak, supporting a team without linking roots. 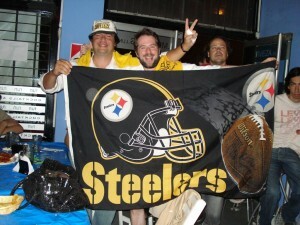 So, that day a felt I started to be a little part of the Great Steeler Nation. Keith put me in. He named me as a “steeler knight” with the Towel as a Sword on my shoulder. I remember I told him, in the middle of the third quarter:”I vote for Harrison for MVP… ” And he answer me: “wait, it wont be that easy…” He really was true!!! That was a special night. The night when a became a real Steeler Fan. Thanks to Keith and his wife.